Sometimes the landscapes we dream up in works of science fiction and fantasy are no match for the real thing. From unusual geological formations to rare and beautiful flora, these natural landscapes seem pulled from another world. 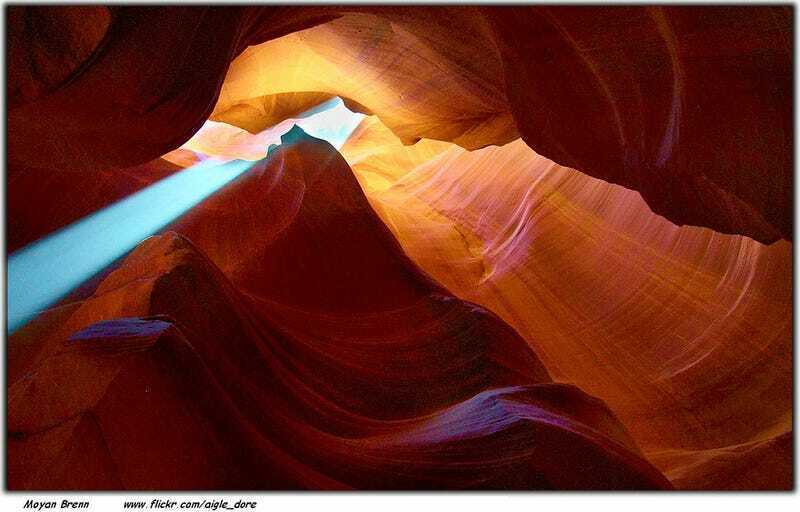 Top photo of Antelope Canyon by Moyan Brenn. Located in the Navajo Nation near Page, Arizona, Antelope Canyon is a slot canyon formed through the erosion of Navajo Sandstone, largely a result of flash flooding. It's the region's most-photographed slot canyon, not just because of the incredible colors and ridges, but also because of the shafts of light that travel in from the surface. It's almost hard to believe that the Giant's Causeway, Northern Ireland's only UNESCO World Heritage Site, isn't man-made. According to legend, the hexagonal columns were built by the mythical hero Finn McCool across the North Channel so that he could meet Scottish giant Benandonner in battle. In reality, the columns were caused by the rapid cooling of a lava plateau, causing the molten basalt to contract and crack into columns. This was one of our favorite entries from the Sierra Club's list of "Earth's Weirdest Landscapes," which pointed us to some of the landscapes listed here. It looks like a steaming eyeball stuck in the middle of the Earth, but Yellowstone National Park's Grand Prismatic Spring is actually the United States' largest hot spring. The rich colors, which make this location particularly striking, is caused by the pigmented bacteria that inhabit the microbial mats around the spring's edge. That pristine blue at the center of spring truly is pristine; the intense heat makes the water sterile. For thousands of years, people have bathed in the travertines of Pamukkale ("cotton castle"), located in Turkey's Denizli Province. The terrace-like travertines were created by mineral deposits from the flow of the region's hot springs. The hardened carbonate deposits make the baths look like frozen structures against the rest of the landscape. Photo by Ana Raquel S. Hernandes. Socotra is famous for it's biodiversity, and a remarkable 37% of its plants are endemic to the island. This Colombian river is often called "The River of Five Colors" because of the brilliant reds, blues, yellows, blacks, and greens that fill it between the wet and dry seasons. This is when Macarenia clavigera, a plant that is endemic to the river floor, shows off its color. Red is the most prominent color, but splashes of other colors pop up as well. Photo by Dave Bunnell, Wikimedia Commons. Until 1986, Lechuguilla Cave, located in Carlsbad Caverns National Park, New Mexico, was used primarily as a source of bat guano, although since the 1950s, cavers had suspected that cave passages lay beneath the rubble of its floor. After a group of cavers received permission to explore the cave, they discovered a vast series of caves, includinging remarkable gypsum and lemon-yellow sulfur deposits in a wide array of speleothems. The 136+ mile cave is the fifth longest explored cave in the world, and contains such breathtaking features as the Chandelier Ballroom, home of the wondrous gypsum formations in the photo above. Thanks to this fantastic example of karst topography, this region of Bohol Province, Philippines, looks like a level of Super Mario Bros. Like Northern Ireland's Giant's Causeway, this natural formation comes with a giant legend: two feuding giants battled by throwing rocks at each other, then forgot to clean up their mess after making peace. The erosion of lifted and fractured limestone into a series of hills may make for a less humorous story, but it's a far more interesting process. Sadly, the hills aren't called "chocolate" because of their crops or flavor; it's simply because they turn brown during the dry season. The limestone formations of Mono Lake in Mono County, California, look almost like cities that have been deliberately grown from the saline soda lake. These tufa towers formed naturally when calcium-rich underwater springs mixed with the lake water's carbonates. However, while the tufa towers themselves are a natural formation, the fact that so many of them are exposed to the open air is the result of human activity. These towers grow exclusively underwater and became exposed after the lake's tributes were diverted, causing the lake level to fall dramatically. Photo by Lobineau, Wikimedia Commons. The Wave formation is part of Coyote Buttes in the Paria Canyon-Vermilion Cliffs Wilderness. If it reminds you of Antelope Canyon, that's because it's also a Navajo Sandstone formation. Its troughs were initially eroded by runoff from a nearby basin and, in more recent eras, by the wind. The result is these gorgeous, curving, multicolored strata. For a particularly stunning view of these caves, check out this photograph by Opticoverload. The towering quartz-sandstone pillars of Zhangjiajie, Hunan Province, China, resemble of foggy forest made of stone. One of these majestic pillars, the 3,540-foot Southern Sky Column, was renamed "Avatar Hallelujah Mountain" in 2010 after—you guessed it—James Cameron's film Avatar. Photo credit: La Venta - Esplorazioni geografiche. The Cave of Crystals, located in Naica, Chihuahua, Mexico, brings to mind Superman's Fortress of Solitude. But these giant selenite crystals were formed by an Earthly power, over the course of millions of years. It's thanks in large part to the conditions of the cave, which sits 300 meters beneath the surface at a temperature of over 100 degrees Fahrenheit with 99% humidity. It's not a place you want to visit for very long. At a quick glance, Bryce Canyon, located in southwestern Utah, appears to be filled with religious icons. It's easy to see how the Paiute, who once settled the region, came to believe that the formations, known as hoodoos, were mythical people whom the trickster god Coyote had turned to stone. They're actually the result of frost-wedging and chemical weathering. It's the reason that Bryce Canyon isn't a true canyon (because it wasn't carved by water) and the cause behind these easily anthropomorphized formations.